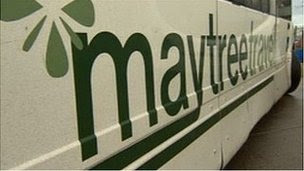 Michael Renshaw, TfGM’s Bus & Rail Director, said: “We have been advised that Maytree Travel have suspended all their services, including more than 40 bus services they are contracted to run on our behalf. Manchester Community Transport, which owns Maytree, had actively been working over the past few days to address the issues that have led to this situation, but it’s now clear they are insurmountable. This is now affecting the level of service being provided this afternoon and into the evening and, unfortunately, passengers should not now expect any Maytree services to run tomorrow or over the weekend. We have already issued several tender documents to secure emergency contracts to ensure these services return in the immediate future and we will be assessing bids today to get agreements in place as soon as possible. “The process involved – which is not just about paperwork, but also about alternative operators securing drivers and vehicles to be able to provide these services at short notice – takes time. “Unfortunately, the circumstances mean some or all of the services affected may not now be back on the road until early next week and passengers are advised to check our website and Twitter or call Traveline for updates on the situation before travelling. TfGM is also working to ensure any school services affected by today’s announcement are addressed as a priority, and information will be provided to schools directly. Maytree service numbers affected: Daytime services 31, 95, 96, 495, 512/3, 516, 525, 526, 527, 544, 551, 553, 559, 570, 597, 680, and 714. Evening services 507, 510, 519, 534, 536, 538/9, 561/2, 571/2, 575/6, 583, 584, 597, 612, 622, 715 and Sunday services 273, 534, 538/9, 576, 583, 584, 597, 622 and 715.